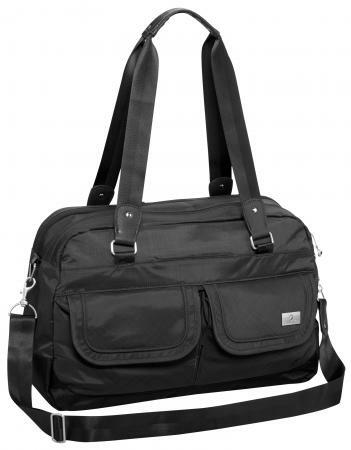 Eagle Creek's Emerson Shoulder Bag has been my favorite go-to bag for business meetings for the last few years. So, I was extremely excited when the folks at Eagle Creek provided me with an opportunity to review a few other items in their impressive collection of travel bags and accessories. The Emerson Shoulder bag is an excellent option for professionals who visit client locations and travel frequently. I love this bag because it holds more stuff than the true messenger bags I have used in the past, yet is much more stylish and professional-looking than a backpack. It has a laptop compartment and a separate zipper compartment that is large enough to hold a small umbrella and a relatively small projector, as well as other supplies. On several occasions, I have actually fit everything I need for a one-night business trip (including a wardrobe change) into this bag. I also like the fact that this great-looking bag can pass for a very large purse, which makes it easy to keep critical gear on my person even when running errands between appointments. For example, I am not comfortable leaving my laptop in my car when I stop by a store or restaurant during the workday, and the style of this bag makes it possible just to carry it in with me. I simply place my actual purse inside this bag before going in. As I have used this bag multiple times over several years, I can also speak to its durability. It has held up very well (in form and appearance) over several years of being used as an airline carry-on bag, day-to-day briefcase and being carried along on multiple car and RV trips. Of course, I don't always pack light, and I don't always travel for business. 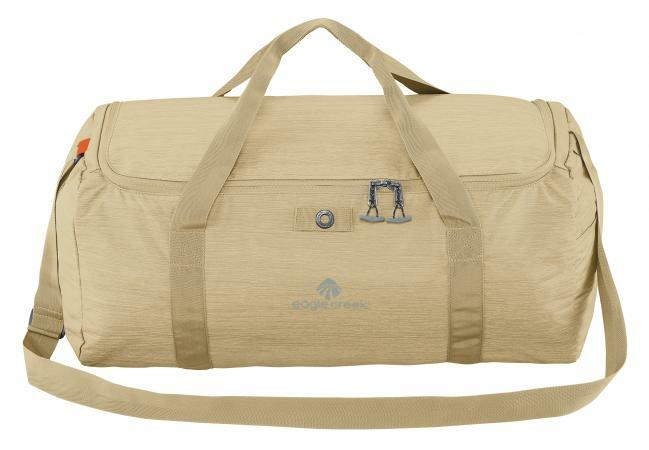 I absolutely love Eagle Creek's Cargo Hauler Rolling Duffel for casual outings, particularly when I need to pack a good amount of gear in a versatile bag. The 90L size that I have weighs just 3 pounds and 12 ounces, so it is very lightweight while also being quite durable. It is also made with a water-repellent, coated fabric called Bi-Tech™ Armor Lite that is designed to provide a high level of durability. This bag is well-made and holds up well to regular use, including being checked on an airplane or carried along on road trips, camping adventures, boating excursions and more. In addition to being lightweight and durable, this bag is also extremely versatile. As someone who travels a lot for business and leisure in addition to being a travel writer, I have used many types of luggage for a variety of different types of trips. I can say with certainty that this is among the most versatile pieces I have seen. Why? It has wheels for easy rolling, straps that make it possible to wear it like a backpack, handles on the sides that you can use to carry it like a duffel bag, and a handle on top so you can carry it vertically. It also comes in a larger (120L) size that weighs exactly four pounds. The larger model does not have the backpack straps (understandably), but does have wheels, duffel straps and a top handle. 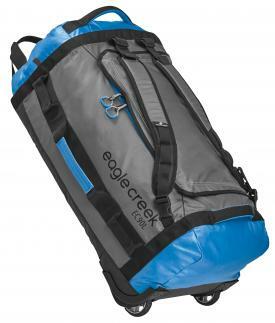 Eagle Creek's Packable Duffel is another great item for both business and leisure travelers. Made of durable, ripstop fabric, this piece ranges in size from a small envelope to a full-size (22" x 12" x 11") duffel bag. I love to use this type of bag when I attend conferences and trade shows, as I can toss it in my regular luggage in its 'packable' state when I am leaving home, then open it to full size upon arrival to fill up with conference handouts and goodies from exhibitors for the trip home. It's also ideal to use in the same way if you enjoy shopping for souvenirs (or just shopping in general!) during your travel adventures. Of course, that's not the only use for this type of bag during travel. I also like to use it as a gym bag and pool bag when I am on the road. Again, I will pack the bag in its folded state, but fill it with the items I need to carry to the hotel's gym or swimming pool during my stay. That way, I have a convenient way to transport various items (towel, sunblock, water bottle, etc.) and a place to store my room key that tucks away easily inside my suitcase when not in use. If you're a fan of super-organized packing (who isn't?!? 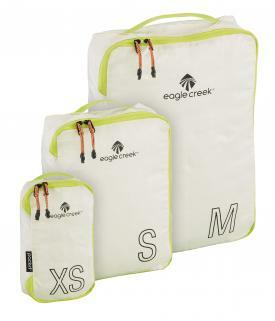 ), you're sure to love Eagle Creek's new Specter Tech™ line of packing accessories. Made of extremely lightweight fabric that is translucent (so you can somewhat see what is inside even when it is closed) and resistant to spills and stains, this line includes packing cubes (compression and regular) in a variety of sizes, toiletry bags and shoe bags. For a particularly unique touch, one of the packing cubes also includes a folding board. While most of the items in this line zip closed, it also features a few bags with have cinch-top closures. The structured garment folder has a Velcro closure. If you have never used packing cubes before, you really don't know what you are missing. The first time I used packing cubes was for another product review that I did several years ago. I didn't understand the benefit until I actually started using them. I have used them consistently since that first experience, and I absolutely love them. Having liked items grouped together inside cubes in your luggage makes it really easy to quickly and easily find what you need inside your bag without leading to a huge mess. This set is particularly awesome because the cubes are so lightweight and available in a variety of sizes and shapes, with options to suit just about any packing need. No matter what kind of travel you do or what types of items you pack, chances are that you'll find something (or several things) in Eagle Creek's impressive selection that will work perfectly for you. Their wide range of styles paired with excellent design, quality materials and sturdy manufacturing are just a few reasons why Eagle Creek travel bags are among the best choices for frequent travelers who love practical, yet innovative gear.